Staining wood can transform the look of everything from fencing to decking. While wood can be beautiful in its natural state, staining can protect the wood and complement landscaping and other home design elements. Staining can seem like a simple project, and that is often true. However, certain woods, such as pine, cherry, maple, and birch, can be difficult to stain. Boards with attractive grain patterns also can absorb stain differently, resulting in blotching and uneven tone. Before beginning a staining project, it is important for homeowners to test the stain chosen on a sample piece of wood to see how the color and absorption turnout. This gives homeowners the chance to understand what they’re dealing with and time to make any necessary accommodations to achieve a more even look. Begin by gathering the necessary supplies. A pair of latex or vinyl gloves will protect your hands. Drop cloths will catch any drips or spills. Safety goggles and a dust mask provide protection if sanding is required prior to staining. If sanding is necessary, homeowners will need an orbital sander, hand sander, and sandpaper. Start with the coarsest grit sandpaper and move to a higher grit for a smooth finish. Wood that is covered in the paint may need to be stripped prior to sanding. Follow the directions carefully when using chemical strippers. Natural bristle paint brushes are handy for oil-based stain applications. Synthetic paint brushes can apply water-based finishes. Many do-it-yourselfers find that foam brushes or paint pads are the handiest because they provide a smooth finish and there’s no need to clean up the brushes afterward. Many professionals recommend using wood conditioners or pre-treaters so that the stain will not leave blotches on the wood. This is especially important for homeowners who determined their wood is prone to uneven color absorption. Allow the conditioner to dry according to product directions. Stain should be applied so that it is evenly coated. Wipe off the excess to get the preferred color. Apply more stain as necessary to get the desired color. 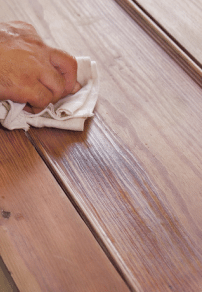 Many stains only offer color, so you’ll need to apply a finishing coat to protect the wood. Otherwise, look for a product that combines stain color and a finish to save time. Remember to remove knobs, hinges, and handles from a piece before staining, as the stain may affect the color of any metal hardware and damage it. Contact Clinton Fence for all your fencing needs.